Fresh fruit skewers are the perfect, refreshing treat for hot summer events. I love busting out the cookie cutters and making these healthy desserts for backyard cookouts. The fruit skewers make it easy for your guests to grab throughout the party and even easier to eat. 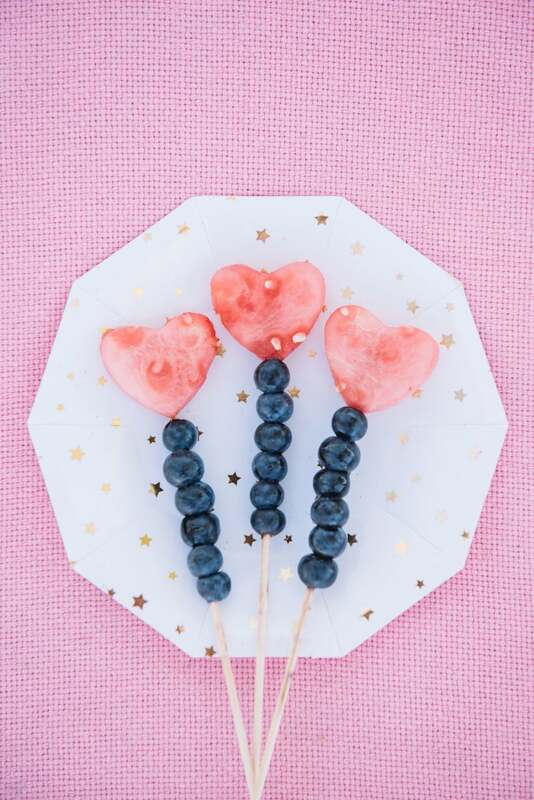 If you’re hosting a family event, these fruit skewers will also definitely come in handy! They’re a great finger food for kids and an easy way to sneak in some fruit servings. A total parenting plus! ;) You can easily make a ton of these fruit skewers with little energy and little cost! Definitely a win-win in my book! You can make these fruit skewers with literally any fruits you like or any fruits you have around the house. 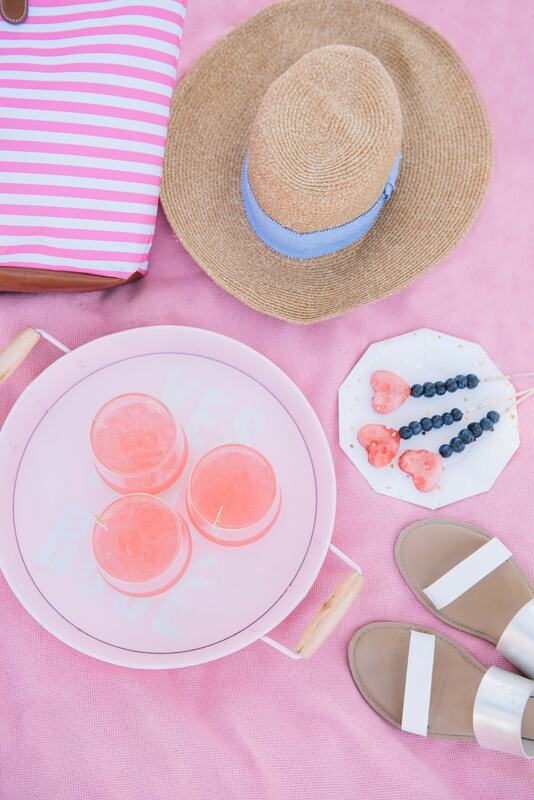 But if you want to stick with a patriotic party theme, then fresh blueberries and yummy watermelon are the way to go! I love the patriotic colors of these two fruits together and the flavor combo is perfect for summer! 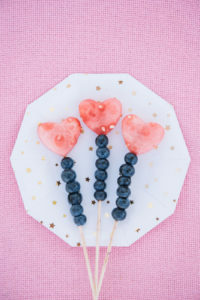 The red, white, and blue make these fruit skewers the perfect dessert for the Fourth of July or even Memorial Day. The tart blueberries are a great pairing for some sweet, refreshing watermelon. Of course, if you and your family prefer other fruits then you can absolutely go for it! I love the idea of adding delicious cherries, blackberries, and even strawberries to the skewer mix. Any of your favorite fresh summer fruits, would be amazing choices for these fruit skewers! 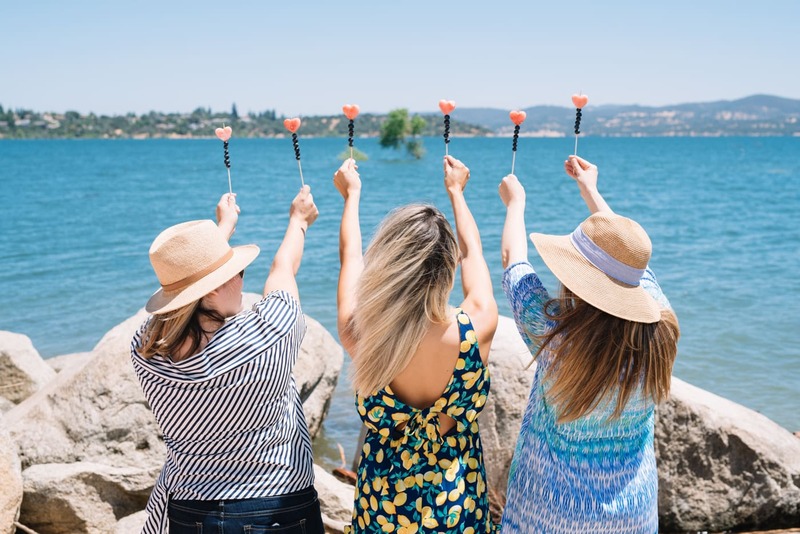 Summer always means tons of fun parties and events, but it doesn’t have to mean hostess burn out! With this these fresh fruit skewers, you’ll be totally set for any patriotic party, without breaking a sweat! What are some of your favorite seasonal summer fruits? Do you have any secret recipes that are perfect in a party planning pinch? Creatively cut your watermelon into specific shapes like stars or hearts. You can easily free-hand slice the watermelon, or really cut down on prep time and use a cookie cutter. For these mini-watermelon slices I actually used the cutest little heart cutter that’s specifically made for fondant. I highly recommend assembling these the morning of your party at the ultimate earliest.